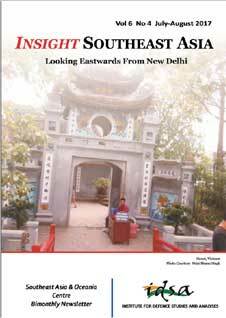 Insight Southeast Asia is the bimonthly newsletter of the Southeast Asia & Oceania Centre, IDSA. It comprises special sections such as Country Profile, Commentary, Book Review, Photo-Essay and News Track. News Track includes important and referenced news summary pertaining to the eleven Southeast Asian countries and Oceania (including New Zealand and Australia).